It’s been a long, snowy winter here in the Midwest. Let’s warm up for spring with a Color-A-Thon fundraiser! 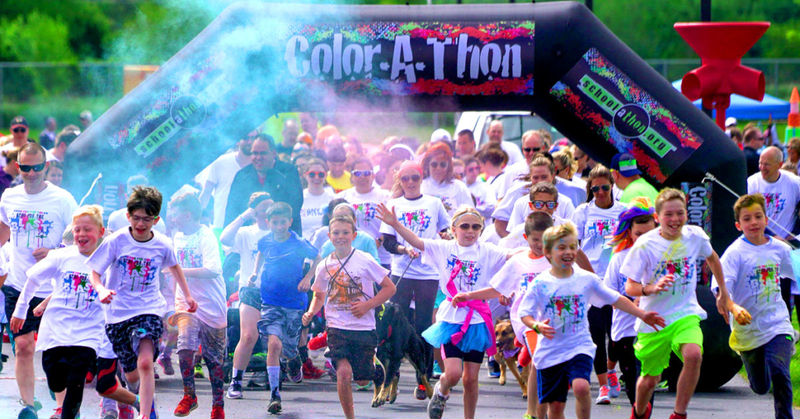 Spring is the perfect time to host a Color-A-Thon fundraiser because it is a fun, active, colorful event for participants and a great fundraiser for your school or organization. People have been cooped up inside and have extra energy to burn off – many want to do it outside. The warmth of a spring fundraiser makes the event perfect for a first day of outdoor fun in the new year. Color-A-Thon fundraisers are also upbeat and colorful, which is sure to bring excitement and happiness to participants bored from a stretch of white winter woes. Your community will be excited to participate and motivated to help raise funds for this fun, outdoor event. You can create up to 70% profit with your Color-A-Thon event! You may be wondering though: where do I start to plan this fundraiser? We can sure help with that, because the time to start is now! We have two variations on our most popular Color-A-Thon event: donation-based and entrance fee-based. The donation-based event uses a pledge site developed for each person to raise funds individually. We will provide you with donation envelopes and a prize reward program that gives people incentive to raise funds. This setup is ideal for elementary and middle school fundraisers. Your other option is to have an entrance fee-based fundraiser which opens the event to the larger community. In this fundraiser, you choose the entrance fee cost (minimum of $30) which will include a color pack and t-shirt. We will provide a custom registration website for your event and will include a money management software to help you keep track of your profits. The best events are never planned alone. Form a group of people that can help with the fundraiser planning tasks and delegate the work. This will ease the burdens of planning from one person’s shoulders and make the planning a team-oriented process. Ensure you are meeting your fundraiser planning deadlines by making a timeline for when certain tasks need to be completed and assigning the tasks to a single member of your planning committee. Doing this will keep you organized and create timely goals for your team to accomplish. You need time to get the word out and get people excited for your Color-A-Thon fundraiser. Start distributing materials or plan an outreach campaign far enough in advance that you give participants time to raise funds or commit to your event. We give you the posters and materials you need, you just need to use them in a timely manner to reach your community. Plan volunteers and their specific roles in advance to help at your event. Members of your community will be happy to support a fun and successful fundraiser, but give notice so there is no confusion on your fundraiser day. To stay organized, document your volunteers and their roles to track the remaining volunteers you need and coordinate volunteers the day of the event. Spring is the best time to host a successful Color-A-Thon Fundraiser, and thankfully, it’s also just around the corner!